UPDATE: The Canon 50D has been announced on August 26, 2008. 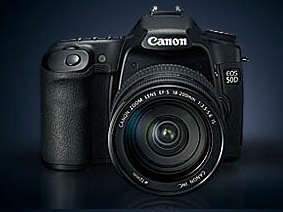 Please see Photography Bay’s Canon 50D Reviews and Resources page and Canon 50D Official Announcement page for more. Canon’s China website has published specifications for the 50D in its public webspace. Although the info is not on the front page of the site yet, it is accessible to anyone. Here is the link (update: it’s down, but this one is still live for the moment 11:51p.m. ET). We keep check for availability; however, there is no listing on Amazon.com search results or any other vendor yet. I’ve set forth the relevant translated specs and info below. Please note that the original specs listed here listed in-body IS as a feature. The translation was wrong and the feature has been removed from the spec list below. The specs referenced the advantages and compatibility with lens-based IS instead. Low: the most about 3 / sec. * Based on these values to use 2 GB of memory cards, Canon testing standards (ISO 100 photos and standard style). *Value in brackets apply to the testing standards based on Canon’s Ultra DMA (UDMA) 2GB memory card. Battery capacity shooting (Based on CIPA testing standards): 50 percent of the normal use of flash photography: 23 ° C/73 ° F at about 640. 0 ° C/32 ° F at about 540. 50% of the use of flash photography of real-time display: 23 ° C/73 ° F at about 170. 0 ° C/32 ° F at about 130. The length of the power cord: About 1.8 m / 5.9 ft.
More info is coming in and I’m still working on verifying the translations of the above specs, so stay tuned to PB’s home page and the Canon 50D page. In camera IS on this model will blow nikons mind. hope its true. The in camera IS is a bad translation. The reference is to the in LENS IS system used by the EOS cameras. No one “accidentally” leaks such information. We will see if the info is reliable or not. Electronista listed the 5D MkII specs over a month ago. It’s being officially announced in 2 weeks. It’s now listed on Amazon.com (no price) and B&H Photo Video (with price and projected availability in October). ¿does the canon 50D have a full frame?